Google Analytics keyword not provided - Any alternative? →Google Analytics keyword not provided – Any alternative? From the image above, keywords that generated over 88% of my natural traffic for the past few days are not provided. So I’m looking for an analytics alternative that will reveal these not provided keywords. Well, in this post, I’m not going to discuss a totally different Google analytics alternative. We want to look at how to capture keyword data from Google Webmaster Tools (GWT) to Google Analytics and still come out with a list of most searched keywords that drive traffic to our blog. With this data, we can monitor our rankings and increase our traffic. This is a simple process that should be done within few minutes. Click on “Set up Webmaster Tools data sharing” and follow the steps as Google walks you through the setup procedure. Once this is complete, you will have access to three reports under the search engine optimization navigational link; queries, landing pages and geographical summary. 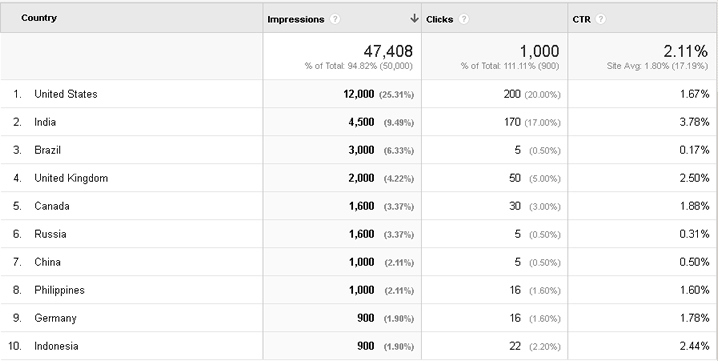 The queries report will show you the keywords you are ranking for – impressions, clicks, average ranking position, etc. Note that this report by default is sorted by impressions in descending order, from the highest to the lowest. This report lists the pages that are ranking well – impressions, clicks, average ranking position, etc. It will show you your most popular pages first. This report shows which countries your search engine traffic is coming from. The country that generates the highest impressions is listed first. NB: In this post, I discussed 10 factors that will motivate advertisers and cause them to validate your advertising offer. Where your traffic comes from is one of the deciding factors. Check out the post for 9 other factors. The ‘Landing pages’ report has similar weakness. It does not give you the keywords driving traffic to those pages. After analyzing these reports, you are still left with a lot of questions on your mind; You have the keywords that drive the most traffic to your blog but to which pages? You have the most popular pages but the question still remains – which keywords make these pages most popular? You may want to go back to your Google Webmaster Tools where these details are provided or try this online seo tool. I’m of the opinion that GWT is one of the best free keyword tools to help you know what’s working already for your blog and how to improve on it. Google analytics keyword ‘not provided’ data is a controversial topic, and there’s no fail-safe way to access the data. However, you can always use alternative solution to gather some amount of that to serve the purpose. Let me hear from you in the comment box. Do you have any Google analytics alternative that is a way to resolve the keyword not provided issue? Does it even matter to you that some of the keywords that drive natural traffic to your site are not provided? Enstine, I’m freaking curious how you achieved over 5k followers on G+, if you already said that please forward me to that article, if you didn’t said that perhaps you can create an article in near future and share some love like you always do. Thanks buddy! Thanks for adding your voice to this post and mentioning semrush.com. Do you know of any tool as free as GA? Indeed a great guide about that hidden keywords that show “Not Provided”. I have already enabled this feature in analytics with my webmaster account. This is such a great tool to look what people are searching around you. Although thanks for writing about it. You too have great time Enstine !!! Honestly speaking, because I only rely on Google Keywords for my posts as I don’t use anything paid etc. this was the first thing I did and it’s all been going well since then. It’s good you’ve shared about it here with the rest of us, just in-case anyone needs this information. Nothing works like Google’s ways! I am struggling from a past few weeks to know from which keywords im driving traffic on my blog as only thing i can see in analytics id not provided for the majority of keyword traffic. This article helped me to know which keywords are driving traffic to my site. Thanks a lot for the article. I’m glad this is helpful Teja! I did’t face the issue, before it appeared I’ve been using SEMrush, Even if used for free you’d still have access to organic keywords. The interesting thing is that: Does’t matter if it’s your own website, just like in Google analytics you can view data of your own site only. Let me know if it helps. Google analytics is a great tool to grab immense amount of stats related to visitor behavior, demographics, device, referral source, OS etc. However, this act of not providing certain high ranking KWs, that drive good traffic to the blog is not much appreciated! Found link to this post on Kingged. And I sure will Kingg this post up there! This post is really helped me. I have configured what you have mentioned in the post. Thank you! I have not done this yet but I absolutely will. I’m the same was as Harleena ” I only rely on Google Keywords for my posts as I don’t use anything paid.” Reading that she has already implemented your suggestion to link our GWT account to our Google Analytics account makes me realize that I’ve been missing out on some great data. Been busy with family moving in from holidays. Enstine, I love using Google Webmaster tools, so many great things about it that you can learn about your blog or website. I also use Bing Webmaster tools as well to find other keywords and things that may be wrong. They do offer different things than Google. I had used the WebMeUp too in the past as a FREE trial. It was good. Thanks for sharing these really helpful master insider techniques! Usually when I read this sort of techie stuff, my brain starts to wanna shut down! However, not so when I read and study your extremely practical material! I’m certainly going to look into what you’re advocating here. And hopefully have some extremely positive results t share in the not so distant future! Thanks for sharing! Mark recently posted…Blogging For Money: Three Things You’d Better Consider First! I’m glad your blog is not shutting down this time. I have enabled both webmasters and analytics and still I am not getting the info of the impressions and the clicks…. from where i can do this and get the reporting of clicks and impressions???? Very informative post and I am totally agree with you that Google Analytics is really an amazing tool and probably everyone using it these days including me. it really feel very frustrated when we see not provided in Keyword list. Thanks for sharing this alternative with us. Google webmaster is really very helpful for finding different things about our blog. I’ve been using GWT since many days and these tools are really pretty and informative to web masters. Personally, I use Google Keyword Planner tool to analytic keyword’s informative and find out niche keywords. I feel better to use this tool because this tool lets me search keyword by filtering : v BTW, thank you in advance dear for sharing this informative article with us.